Welp buckaroos, Pendleton’s been a real hoot but it’s back in the saddle today for another epic ride. And depending on how hard you hit the Round-Up, you’ll be rested and ready to ride. 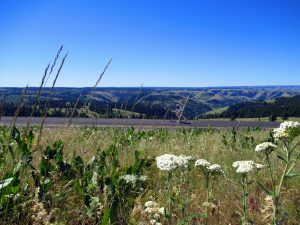 We leave Pendleton the same way we came in on Wednesday–down Mission Road and through the Umatilla Reservation. Looming in the distance sits our biggest challenge of the day. It goes by two names – on a map it’s called the Blue Mountains, but to locals it’s Cabbage Hill. Just before the road starts going up, you will see St Andrew’s Mission to your left. Emigrant Road, or old Highway 30, snakes its way up this hill (or mountain) revealing one breathtaking vista after another. 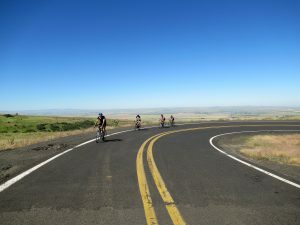 At several points during the climb, you can look back down the hill and see the winding ribbons of road that you just rode up. Shortly after you reach the summit, there’s a shady and informative rest stop at the ominously named Dead Man’s Pass. 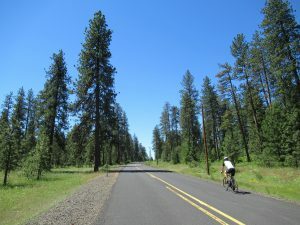 From here there are joyful miles of riding through forests of pine, spruce and fir on our way to lunch on the banks of the Grande Ronde River. After lunch it’s back onto the wide shoulder of Highway 84 to cruise all the way into La Grande and our bittersweet last night with friends around the main stage and beer garden.